The next Recreation Committee/250th Celebration Planning Meeting will be Thursday, April 4th at 6:30 p.m. at the Reed Free Library. Your ideas and participation are welcome! Festivities for Surry’s 250th Celebration/Old Home Day will be held August 9 – 11 and 16 & 17, 2019. 6:00 – 8:00 p.m. Ice Cream Social under the tent (donations accepted). 9:15 a.m. Line up at the Charter School parking lot for the Parade — walkers, strollers, wagons, bikes, antique cars or tractors welcome to participate. Bring a cake to participate. Bring a dozen cookies to participate. Cookies will be the dessert for the Chicken BBQ. Advance purchase of tickets recommended. 1:15 p.m. Card Bingo under the tent. Bring a non-perishable, non-expired canned or boxed food item to participate. Items will be donated to the Keene Community Kitchen and the Fall Mountain Food Shelf. 8:30 a.m. Pancake Breakfast at Surry Village Charter School. Town Potluck under the tent. Each family should bring a dish and dessert to share. Beverages provided. Pie eating contest for kids age 12 and under. 12:30 p.m. Largest zucchini contest — bring your biggest zucchini! 2:00 p.m. Hike in the Graf Town Forest sponsored by the Surry Conservation Committee. 7:00 p.m. Tom Foolery Band with catering by JimEddie’s and brews by Branch & Blade. $3 cover charge. Bring ID. Food & drink purchases will be made directly from the vendors. 4:45 p.m. Meet at the Town Hall for the bus to the Festival of Fireworks in Jaffrey. Bus leaves at 5:00 p.m.
$3.50 per person for seat on the bus. Food vendors will at the event, but you may bring your own food/snacks and non-alcoholic drinks. NO alcohol is permitted on the bus or at the event. Return time approx. 11 p.m.
Go to www.SignUpGenius.com to reserve event spots, purchase a t-shirt or Commemorative Mug, sign up for the Arts & Crafts Show and more. Surry Old Home Day t-shirts are for sale! Choose from red, blue or green in various sizes. Send an email or contact a Rec Committee member to purchase your shirt(s) or if you have questions about Old Home Day and/or the 250th Celebration. 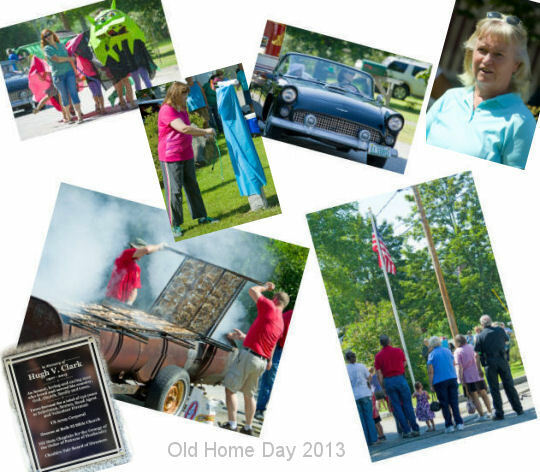 Old Home Day is held in odd years on the 3rd Saturday of August. The Surry Recreation Committee is in charge of the activities and we welcome your participation and suggestions for activities. Please email or call one of the Rec. Committee members.